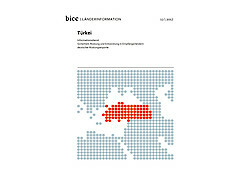 The current Country Report Turkey of BICC (in German) gives an overview over basic data on the military sector and reviews the practices of the country with regard to the criteria of the EU Common Position on arms exports. Turkey is one of the largest arms importers worldwide, and it purchases these arms primarily from the United States. The Report examines the development of German arms exports to Turkey. The country purchases larger amounts of German armaments. As of late 2016, the German government had initially pursued a more restrictive authorization practice for arms exports to Turkey. The Country Report analyzes the realities in Turkey using the criteria of the EU Common Position and describes the current human rights situation in the country as highly problematic. It also provides facts on the military involvement of the country in regional violent conflicts and the Kurdish–Turkish conflict.